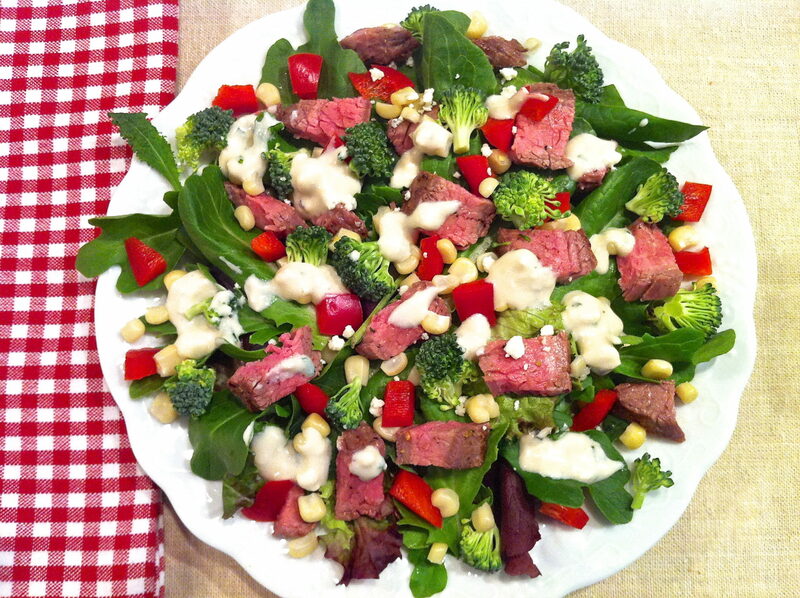 One of my go-to “fast food” meals, is this grilled steak salad. Typically, I use leftover flank steak, purchased from a grass-fed beef stand at our local farmers market. Strip steaks or your protein of choice may be used. To ensure an easy meal on a busy night, I purposely buy enough to enjoy straight off the grill one night and for leftovers later in the week. Sliced thinly and served as a hearty salad, I need about half as much steak for my family of four when eaten in salad form. Flank steak is a relatively inexpensive cut of meat that tastes great with a mere sprinkling of sea salt and freshly ground pepper and grills to medium-rare in a quick four minutes per side. I often use a natural spice rub similar to Montreal steak seasoning (the spice guy at our local market calls it “Quebec” seasoning, which I get a kick out of) but the brand name version tastes great, too. This recipe can be viewed as a framework. Vary it according to what you have on hand and what you like. Avocado is a delicious addition; black beans work well, too. Leftover fresh corn and snipped fresh herbs in the summer months kick it up an extra notch. My homemade ranch dressing is light but flavorful and really makes this meal special. I like to make a jar-full and have it on hand. If using fresh buttermilk, the dressing will last at least a week in the refrigerator. Recently, I have been making this salad with Greeked-Out Gorgonzola for a blue cheese twist. Simply click on the links for either recipe. Layer steak and veggies on top of greens. Drizzle with dressing of choice and toss. Sooooo easy!